When Ronald E. Moore, executive producer of Battlestar Galactica, started work on re-imagining the 70’s cult classic sci-fi series, he wanted to avoid one of the biggest cliches of modern TV science fiction: Technobabble. No character was ever to “Reverse the polarity” to create an “assymetrical pulse variance”, since he knew full well that the average viewer is more interested in story than faux-science. He wanted a story about real people, in a real working space ship that viewers (both scientist and layman) could identify with. So he hired Kevin Grazier as the show’s Science Advisor. Grazier is more than qualified for the job: He has six university degrees in science and computing, he has a background in naval aeronautics and he is currently employed by NASA’s Cassini mission where he both operates the camera and writes software to coordinate scientists working time with mission parameters. 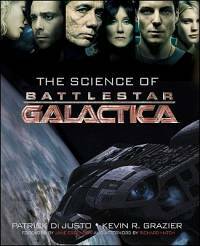 He has just released a book, The Science of Battlestar Galactica, in which he explains all the technology and jargon used in the show.